Making a simple soup should be as it sounds, simple. There may be a lot of ingredients, but the proper layering and prep should make that a breeze. This recipe does exactly that. You will get all the vegetables you are craving and you don’t have to do any major shortcuts by using canned everything. Everything is fresh and ready to go, even the lentils, who unlike beans, don’t need a pre-soak, they’re ready to cook just like rice. Lentils are great for last-minute dishes because you don’t have to pre-soak them or cook them for hours. 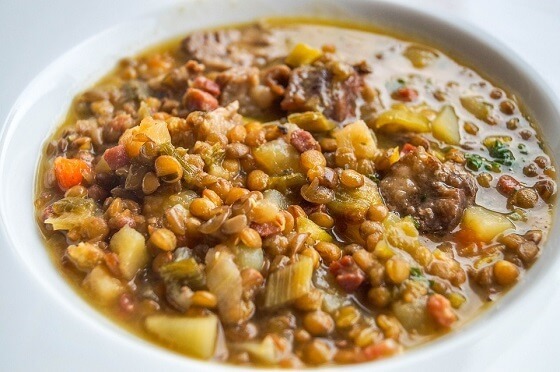 Pick the right lentils, however, and you can simmer them for hours in a slow cooker, creating an amazingly hearty soup. Green lentils are a great choice for salads because they keep their shape even after cooking.